The Asus Transformer Book T300 Chi has moments of greatness, coupled with moments of madness. It's almost trying too hard to be an Ultrabook, which just isn't necessary for a hybrid device. Do you believe the hybrid hype? Windows tablets have failed to really take off in the way Android and Apple tablets have, but Windows is where it's at if you're after a hybrid for productivity. The Microsoft Surface 3 proved that. The Asus Transformer Book Chi T300 is an alternative to Microsoft's flagship Windows hybrid, complete with included keyboard and a more traditional laptop look and feel. But with its release mechanism there's the option to use it as a 12.5-inch monster tablet too. A surprisingly great keyboard and sharp screen are things the Transformer Book Chi T300 can be proud of. But it's let down by battery life, which really isn't too hot for a hybrid like this. Unless you're sure you need the hybrid design, we'd be tempted to just buy the pure Ultrabook appeal of the cheaper Asus ZenBook UX305. The Asus Transformer Book Chi T300 is the big brother of the Chi T100, a 10.1-inch equivalent hybrid that we rather liked, despite some small issues. These are distant descendants of the very first Transformer hybrids which first arrived back in 2011, and ran the Android operating system. Remember those? Well the T300 is quite a different beast in a number of respects. First, it doesn't seem remotely cheap and cheerful, whereas some of the earlier Transformers were pretty much plastic fantastic. The back of the screen section and the keyboard surround are both aluminium, with a MacBook-like look and feel. Aside from that these panels are dark blue rather than naked silver, as you can see in our photos. The underside of the keyboard is plastic, but this isn't something you'll notice too much, and probably helps to stop heat build-up from becoming too obvious as well. No-one likes toasty knees, right? There is no locking mechanism keeping the screen attached to the keyboard of the T300 Chi, either. Instead, there are just little metal guides on the base and some strong magnets. A quick yank is enough to separate screen from keyboard, turning laptop into tablet. It's pretty slick, just like the T100 Chi's methodology. But there are compromises involved. Some are the sorts of things we see in almost all devices in this class, but others are signs Asus is happy to try our patience. First, the normal sacrifice: the Transformer Book Chi T300's screen doesn't fold back very far, meaning it'll always seem pretty upright. This is because the display not only holds all the system's brains, but is also topped with Gorilla Glass, which naturally adds some weight. If it was to tip back too far, the whole thing would simply fall over. Then there's the design of the thing: in order to keep the display surround slim-ish and the whole device pretty portable, there's hardly any room on the keyboard. This results in a tiny trackpad that's not great to use. Most Ultrabooks have trackpads at least twice the size. It gets annoying, making any multi-finger gestures feel cramped and fiddly. It's only the size that disappoints, though, as the actual surface and feel of the button action is good. It's an Ultrabook-quality pad, squeezed down small enough to make you want to stamp on it. You'll probably get used to it, but we found it fiddlier than the Surface's tiny pad as its traditional button layout doesn't suit the space on offer that well. Then there's the tech behind the keyboard module. 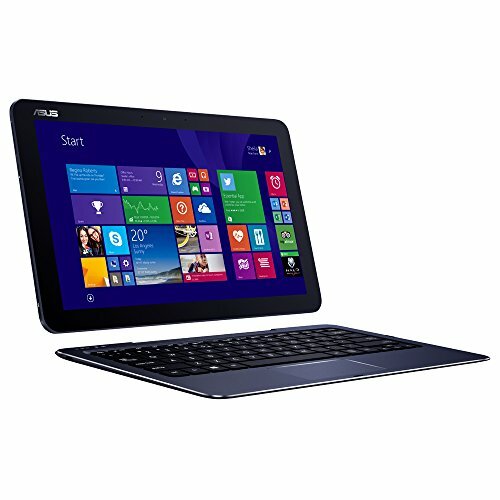 The Asus Transformer Book Chi T300 keyboard doesn't hook into the screen directly, instead communicating over Bluetooth. This causes a tiny delay after the pad has been left for a while as it reconnects to the mothership. However, the effect is fairly minor, and seems to have improved since we used the T100. It does mean you have to separately charge the keyboard, though, and as there's no power connectivity between the two parts it means the keyboard battery can't be used to boost the stamina of the main unit when connected. This annoyed us about the T100, and it rears its head in the T300 again. The side effect of the Bluetooth-based hybrid style that really gets us holding up our hands and screaming "really?" at the thing is connectivity. The Asus Transformer Book Chi T300 is a laptop-size device with very much tablet-grade connectivity. There's no full-size SD card slot or even a full-size USB. If you want to attach a mouse, an external hard drive or your camera's memory card, you'll need an adaptor. Asus provides one in the box, but it really smears the Asus Transformer Book Chi T300's lovely shininess. In short: having to remember to bring and use the adapter is a pain. What you get on the Asus Transformer Book Chi T300's tablet part are a microHDMI port, microUSB 3.0 port and headphone jack. There's also a microSD card slot on the bottom edge, hidden by the keyboard base when it's attached. You don't get the benefit of USB charging as a commiseration prize, as it uses a laptop-like cylindrical adapter. In some ways the Asus Transformer Book Chi T300 brings you the worst of both worlds. But not all, thankfully. While the trackpad is a bit of a dud for a near-13-inch laptop, the keyboard is very comfortable. Action is predictably shallow, but also very crisp and definite. It's approach and feel is similar to that of a MacBook Pro. In power terms, though, the Asus Transformer Book Chi T300 has a lot more in common with the new MacBook, the 12-inch one. Both use an Intel Core M processor, the relatively new chipset family designed for battery efficiency and being able to slim everything down to an almost alarming degree. It's what lets Asus pack-in a "proper" laptop CPU into a laptop only 9mm thick. We say proper, but the Intel Core M is not, and is not meant to be, as powerful as the Intel Core i5 you can get from a more traditional laptop at this sort of price. However, you'll only notice the difference significantly if you really push demands at the Transformer Book Chi T300. Asus has made sure it has the chops elsewhere to provide smooth performance for everyday tasks like browsing, word processing and so on. It has 8GB RAM and a 128GB SSD, far more than most hybrids can offer. The T300 Chi has the core specs to match its price, which is pretty high compared with most non-Microsoft hybrids. The SSD is also far faster than the solid state memory you'll generally get in real entry-level hybrids. We saw how fast it could rev and found it'll write at about 230MB/s and read at 400MB/s. While not mind-bendingly fast by SSD standards, it's not too bad for what is a non-performance computer. There's something missing, though. The Asus Transformer Book Chi T300 has a processor designed to be very efficient. So much that it's a totally fanless design which means silence no matter how hard you push it. However, its battery life tells a different story. We've been using the Asus Transformer Book Chi T300 as our main computer and have found that it doesn't get your through a full day's work without a recharge. With screen brightness at a reasonably generous level you're not going to get much more than 5.5 hours from a single charge. That's pretty poor for something that seems to otherwise revolve around, and make sacrifices for, portability. MacBooks do better, the Microsoft Surface does better, as does Asus's own UX305. And that laptop is kind of like a non-hybrid alternative to the Asus Transformer Book Chi T300. Battery life in the T300 Chi is, therefore, most perplexing indeed. And one of the performance issues that holds this model back from greater things. However, looking at the screen specs and there's a clear indication as to why the battery is depleting so rapidly. Our version of the Asus Transformer Book Chi T300 has a QHD display, packing a 2560 x 1440 resolution into this 12.5-inch screen. Let's now complain too loudly, though, it's a very sharp screen for a laptop, and looks great. Although when used as a tablet you may start to notice it's not quite as sharp as an iPad Air 2 or something with similarly high pixel density. The screen is also very vibrant indeed, with the sort of glossy, glassy finish we see on virtually every other tablet display. It's a punchy attention-grabber, that's for sure. However, it has a few problems. First, at certain brightness levels it can seem oversaturated, lacking some of the natural look you get from plenty of rivals. So the question is: are you put off by colour-drenched tones or not? As we've seen in some other Asus laptops, the Asus Transformer Book Chi T300 also has a very domineering Auto brightness setting. We like the max brightness setting to be a fair chunk brighter than we're likely to need, and the lowest to be deeply dim. But here the top brightness tends to be just a shade over what most people will favour, likely an attempt to keep battery life in check (or at least try to). Don't get us wrong: take it outside on a sunny day and the Asus Transformer Book Chi T300 will crank up the backlight to compete with the best of them. But at other times it takes a bit of a nanny state approach. There's also quite a lot of backlight bleed, the very extreme edges of the screen appearing brighter where the LEDs sit. So the Asus Transformer Book Chi T300 screen is good, pixel-packed for sharpness, but isn't quite as good as the spec numbers may suggest. Common to most of Asus's other super-skinny tablets, the speakers at each end of the screen aren't much cop either; they're fairly small-sounding and not all that loud. Battery life isn't as good as it needs to be, in what is primarily an ultra-portable computer; the trackpad is small and finicky for something with a 12.5-inch screen; and what's the deal with the decision not to put in a full-size USB port? We get that a slim design makes this super-difficult, but when you're asking for upwards of £700 for a hybrid, it also needs to be able to feel like a serious laptop. Which brings us to our general feeling about the T300 Chi: it's an ultra-portable that's almost trying to be too much the Ultrabook. But Asus already has the excellent mid-range UX305 to handle that. So while the T300 Chi looks like it could be king of the hybrids, and almost succeeds in some areas, there are just a few too many little bits missing in its personality.